Kiev’s army shelling near Lugansk, eastern Ukraine, took the lives of two Russian journalists – Igor Kornelyuk and Anton Voloshin, who were filming refugees leaving the scene when a shell hit amidst their small group. 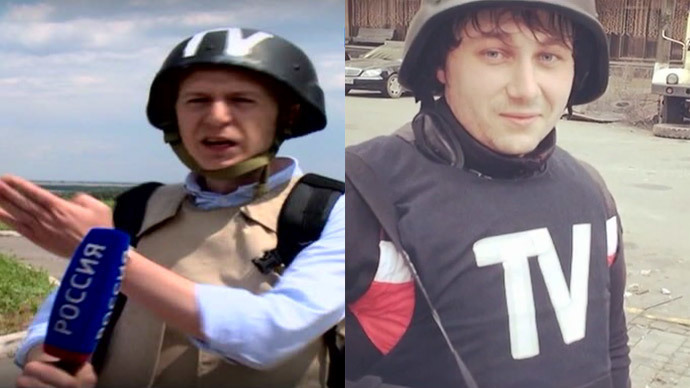 The two journalists working for Rossiya TV died from their wounds, with reporter Igor Kornelyuk passing away on the operating table. Later in the day, the death of Anton Voloshin, a sound engineer, was also confirmed by the channel. According to RT's sources, Voloshin died immediately at the scene. But as the fighting was ongoing and it was not possible to approach the body, the report took several hours to verify. 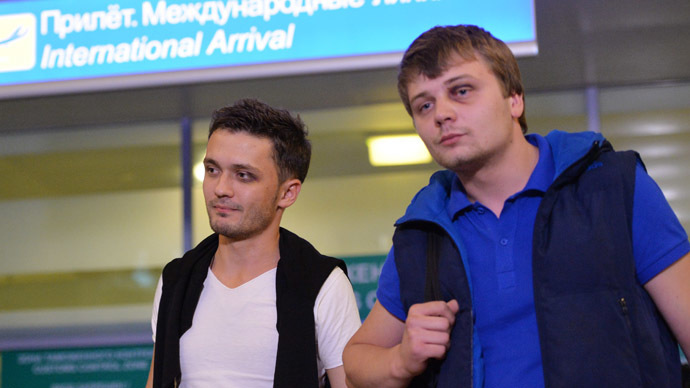 Only one of the Rossiya Channel crew survived – Viktor Denisov, the cameraman, who identified both Voloshin and Kornelyuk. 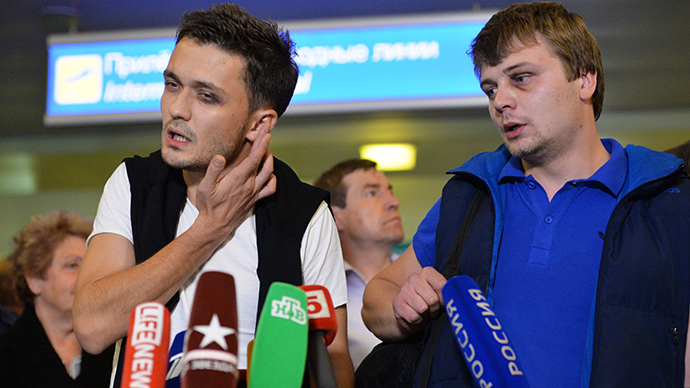 He told LifeNews that he was standing 100 meters from the spot where the mortar exploded. “I must say I was really lucky, I’d walked toward our cars, about 100 meters away, and that’s when the shelling started. My colleagues were supposed to have been out of the range of fire, but for some reason one of the shells flew straight into them,” Denisov said. When the attack began, Denisov ran toward the fleeing residents, who were nearby. They managed to escape together. The cameraman recalled getting closer to shoot some footage, but was told not to go further. As soon as the soldier motioned with his hand for everyone to get down, Denisov heard the pop next to the defense forces. The Rossiya crew had been taken to the scene of the shelling by taxi. 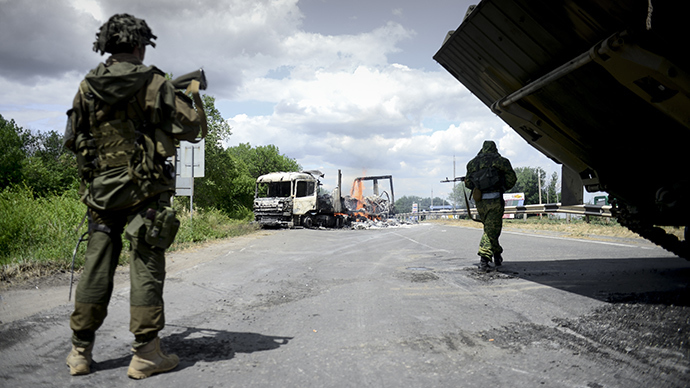 They were escorted by the self-defense forces in a village near Lugansk and headed toward a local checkpoint. The taxi driver, who was giving a ride to the three journalists, said that a shell landed right at the spot where they were standing. “Three journalists and 10-15 militias came under fire. We were standing at a traffic police post at the entrance of the town of Metallist. Journalists got out of the car to observe the fighting and shoot video of the smoke. Literally a minute later, several shells hit them right at the spot where they were standing,” the taxi driver recalled. As the news of the incident emerged, the Russian Foreign Ministry condemned the attack and the killing. "The death of the Russian journalist near Lugansk has shown in its entirety the criminal nature of the forces that launched the military operation in the country’s east," said the ministry in a statement. "We are proud of all journalists who, coming under machine-gun fire, shelling, artillery or aircraft bombs, courageously deliver the truth about what's really happening in Ukraine. It is the very truth authorities in Kiev and various militant groups are afraid of, who have organized real terror towards journalists from Russia," Russia's Foreign Ministry statement says. The ministry said it was awaiting strong condemnation from all global media outlets. "We demand Ukrainian authorities immediately carry out an independent investigation into this tragedy and punish the culprits," the statement read. OSCE Representative on Freedom of the Media Dunja Mijatovic condemned the killing of Russian journalists in Ukraine and called for those responsible to be brought to justice.